Better Buy: Welltower Inc. vs. Ventas, Inc. 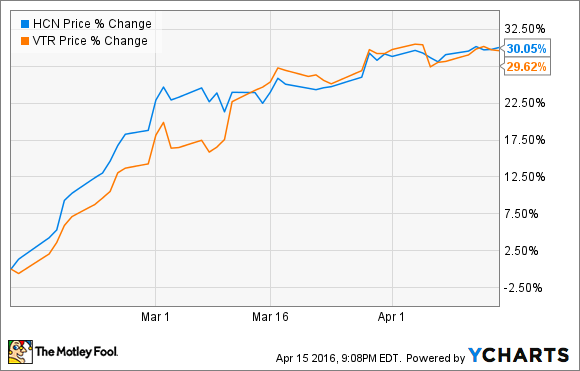 Which of these two healthcare REIT giants is the better deal right now? I've written many times before about healthcare real estate as a long-term investment, particularly when it comes to giant healthcare REIT Welltower (NYSE: HCN). However, the entire healthcare REIT sector has been on a tear lately. With most major names up 30%+ in the past two months or so, it's more important than ever to shop around to make sure you're getting the best value. Ventas (NYSE: VTR) isn't far behind Welltower in size, and its investment strategy is comparable, so it seems like a good candidate for a head-to-head match-up. Let's see if one of these REITs looks like a clear winner when we stack them up side by side. Why invest in healthcare real estate? Healthare real estate is an attractive market to invest in for a few reasons. First, the market is large (about $1 trillion in size), and is highly fragmented. No REIT owns more than a 3% share of the market, and less than 15% are owned by REITs at all, which means there will be plenty of consolidation opportunity in the years ahead. To put this in perspective, more than 50% of hotels and more than 40% of malls are owned by REITs. Plus, the population is aging rapidly, which means that demand for both of these REITs' core property types is almost certain to rise. In fact, the population of senior citizens in the U.S. is growing at seven times the rate of other adults. By 2030, the 75-and-over population is expected to grow by 72%, while the 21-74 age group is forecast to grow by just 10%. Why do we care so much about the size of these REITs? Simply put, size translates to strength and stability, as well as cost savings. Just to name a couple of examples, Ventas' national culinary program produces food cost savings of 13%, and national-scale property management contracts save 11% from those costs. In short, a larger portfolio of properties can be run more efficiently, and the REIT's income isn't as reliant on the performance of each one. Both Welltower and Ventas are quite similar on paper, with just a few key differences. The REITs are similar in size, with Welltower's 1,482 properties exactly 200 higher than Ventas' total. And, the majority of both companies' real estate portfolios are made up of senior housing properties -- 64% and 57% for Welltower and Ventas, respectively. Both have been rather aggressive when it comes to acquiring new properties. Ventas invested $5 billion in acquisitions last year, and Welltower's $27 billion invested since 2010 implies a similar strategy. Another difference is the geographic diversity of the properties, particularly when it comes to international expansion. The vast majority of Ventas' properties are in the United States, particularly located in high-barrier coastal markets. Welltower is expanding rapidly into the UK and Canada, with 267 properties in the two foreign markets, and a rapid pace of new investment. In contrast, Ventas has just a handful of international properties. Aside from those differences, the two companies are quite similar. Both have BBB+ investment-grade credit ratings that give them access to adequate capital to pursue acquisitions, and both have similarly strong balance sheets. And, both have newer, more attractive properties that the industry average, located in markets where the median household income and home values are significantly above average, resulting in stronger occupancy rates than peers. Both companies pay similar dividends -- Welltower and Ventas yield 4.9% and 4.6%, respectively, as of this writing. However, this doesn't tell the whole story. In terms of recent performance, Ventas is the clear winner. The company has managed to increase its FFO by a 10% annualized rate over the past decade, which has allowed a 9% dividend growth rate that is far superior to its peers, including Welltower. However, it's tough not to love Welltower's 45-year track record of dividend growth and stock performance. Investing isn't just about dividends -- total returns are the best measure of a stock's overall performance, and Welltower has produced a 15.6% annualized total return since 1971, handily surpassing the S&P 500 -- an amazing level of performance to sustain for such a long time. In fact, a $10,000 investment in Welltower's IPO would be worth $680,000 today. In fairness, it's best to compare the REITs' performance during the time they both existed, since it's unfair to speculate what Ventas might or might not have done if it had gone public 45 years ago. Welltower has a slight edge in total returns even though Ventas' share price performed better over the approximately 20 years both REITs have existed. And over the past decade, while Ventas has been increasing its dividend at nearly a double-digit rate, they're neck-and-neck. So while Ventas has done an excellent job of increasing dividends in recent years, when it comes to the metric that matters most to investors (total return), both companies are pretty evenly matched. 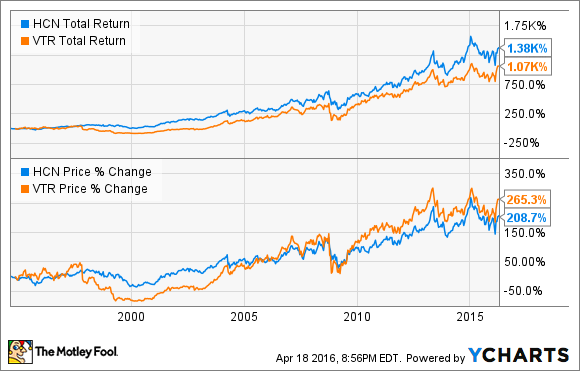 Since both REITs have a similar history of performance, let's see if their valuation will allow us to declare a "better buy." When evaluating REITs, the traditionally used P/E ratio isn't too useful. Specifically, "earnings" aren't a great representative of a REIT's profitability, so we use a metric called funds from operations, or FFO instead. Using the FFO of these REITs, both from 2015 and the guidance for 2016, let's see if either company looks more attractive. So the valuations of these two healthcare REITs are virtually identical. It's tough to declare a winner here. These companies have similar business models, investment strategies, and performance histories. And, to make the choice tougher, they trade at the exact same valuation. I tend to prefer Welltower for their decades-long track record of consistent dividend increases and market-beating returns, but it's really hard to make a strong case for one over the other. Both of these healthcare REITs are winners, and you can't go wrong with either one. Editor's Note: A previous version of this article incorrectly stated that Welltower doesn't own medical office buildings. The Fool regrets the error.